Read about Preliminary Practices in Open Heart, 19.4.2019. Next opportunity to learn Open Heart Yoga online is on 28th of April. Register now. 12.4.2019. Teachings on Bodhicitta continue. Live Webcast today on Tuesday 9th of April at 6-8 pm EET at Open Heart.fi @ Facebook. Welcome all! 9.4.2019. All weekend events and online events, including Open Heart Yoga Online Courses, are free of charge for ordained monastics. Please state your lineage when registering. 4.4.2019. Calendar has been updated with teachings in Moscow, Russia in May 2019! Welcome all! 29.3.2019. Join Live Webcast on Tuesday 6-8 pm Finnish time/EET at Open Heart.fi-Facebook group. Kim will give teachings on bodhicitta and especially the Mani Mantra. 25.3.2019. It is common for dzogchen practitioners to receive many or numerous "pointing out instructions" from their lama or teacher. In pointing out the lama demonstrates the dharmakaya nature of mind which puts the minds of the students also in natural state. When the lama demonstrates it, it simply means the lama is in that state of nonmeditation. So it is usual that dzogchen practitioners receive this pointing out from their lama many, possibly hundreds of times, before they "get it", before it comes the default mode of the student. This process necessarily takes many years, likely decades, also because the student has to go to the lama physically to meet him or her. This is the traditional way. It is of course valid but takes a long time. In Open Heart, the teacher also gives pointing out through verbal means and direct demonstration, on top of tantric empowerments which also are a form of pointing out. But pointing out the nature of mind, as done by dzogchen lamas, has a secondary role in our practice because of the differing nature of the practices we do on daily basis. All Open Heart practitioners practice Dynamic Concentration as a part of their Open Heart Yoga practice and in less formal ways (tib. semdzin), in their daily life. Because Dynamic Concentration shatters the mind (tib. sem) and reveals the nature of mind (tib. semnyid) very effectively in very short period of time, the students do do-it-yourself-pointing-out-the-nature-of-mind every day, that is, the practice enables them to "get" pointing out instructions on daily basis. Because they shatter the mind and recognise the natural state, this automatically makes their mind transform very quickly. This is why Open Heart practitioners have so many irreversible shifts so fast, and when they have the 11th major shift, open the 11th bhumi, natural state comes their default mode. At the moment 20 practitioners of our sangha has achieved this stage within few years, not decades. That is fourth, 25%, of the whole sangha. Needless to say I am very proud of our method and the achievements of my students. It is all because of Guru Rinpoche's living blessings. Everyone is invited. Namo Guru Rinpoche, Kim. 22.3.2019. Read "No Difference Between Physical or Nonphysical Master" by Togden Shakya Shri and "If You Want To Be A Terton" by Kunzang Dechen Lingpa, 21.3.2019. I've been invited to teach in Moscow, Russia, in May. The date is not yet confirmed but the event will likely take place on Friday-Sunday 24th-26th of May. The event is organised by Vadim Ginzburg and Mikhail Reider. This event is a "City Retreat" which means that we will practice Open Heart Yoga, Guru Yoga, Ati Yoga and I will give talks. Everyone is welcome to join the event but one gets most benefit if one has already learned Open Heart Yoga level 1. It can be learned through the internet beforehand. Now, Vadim and Mikhail would like to ask people who are interested in joining the event to contact them, so that they get some sense how many people are joining. Please email Vadim in his email as soon as possible: v.v.ginzburg@gmail.com . Also, if you have friends who might be interested, let them know. Read about Empowerments in Open Heart, 10.3.2019. Watch a newly recorded Introduction to Buddhist Tantra and Open Heart Yoga. 5.3.2019. 140 people have awakened through our Guidance to Awakening. Due to the high demand of guidances we are experimenting giving guidances to small groups. 25.2.2019. Join Online Introduction to Tantric Yoga and Open Heart through Zoom on Sunday 3rd of March. Welcome all! 24.2.2019. Read Feedback and Comments from course participants and Open Heart practitioners. 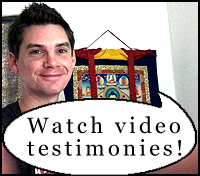 Also see their Video Testimonies. 24.2.2019. Looking into "The Future of Open Heart". 21.2.2019. New edition of Awake!-ebook is now available for free! It has 50 pages more materials and fixed English throughout! 4.2.2019. Next Online Empowerment of Open Heart Yoga will be held on Sunday 24th of February. See Calender and register well in advance. 30.1.2019. Calender has been updated. 22.1.2019. Listen senior Open Heart-practitioners discuss Opening and Perfecting of Bhumis, Karl and Jonathan, and Helena. 16.1.2019. Learn and start Open Heart Yoga this month! Next empowerment will be held on Sunday 20th of January. Find info here and register today! 7.1.2019. Open Heart head teacher and founder, Kim Katami, became a member of Association of Professional Spiritual Teachers (APST) since 2018. APST is an organisation that gives emhpasis on ethics and professional integrity in the field of spirituality. Open Heart Sangha has also become a member of Network of Buddhist Organisations since late 2018. 5.1.2019. Read "Discussing Awakening and the Two-Part Formula at Dharma Overground" at Open Heart-blog, 23.12.2018. Read "How Zen Buddhism Can Be Bettered" at Open Heart-blog, 10.12.2018. Read "Just As It Is - All Beings Are Free" at Open Heart-blog, 8.12.2018. We have re-opened applications for 3 free places of Guidance to Awakening. Read info and apply. 2.12.2018. Tomorrow, Sunday 2nd of December, is the last chance to learn Open Heart Yoga this year. Read info, register by email and join the Zoom video session. After the empowerment, you can learn the techniques from recorded videos. All are welcome! 1.12.2018. Kim is travelling to Japan from 20th until 30th of Nowember and during this time is not reachable through email. You can send your course registration for Online Empowerment of Open Heart Yoga on 2nd of December, as normally, and will get a reply on 1st of December. 17.11.2018. Read Kim's "Invitation to Open Heart", 13.11.2018. Join the next Online Empowerment to Open Heart Yoga on 2nd of December and start your practice. Open Heart Yoga is the main practice of Open Heart, that enables quick deconstruction of self-delusion, through a successive series of awakenings (bhumi openings). This enables us to truly know our inner freedom directly, without religious dogma or unnecessary rules. Open Heart is a path for normal laypeople, with job and families. Welcome all! 13.11.2018. Open Heart-weekend seminar in Toronto, Canada, taught by Kim, is being planned. The date is not yet finalised but it will likely take place in few months time. If you would like to help the organiser, David Hoffman, or are interested in joining the event, contact him by email, me(at)davidhoffman.ca, and he will keep you updated. 6.11.2018. Read "That Was Emptiness!" and "Three Approaches: Mantra, Mindfulness and Direct Path" at Open Heart-blog, 4.11.2018. We received 10 applications for free Guidances to Awakening, that were all approved. New applications are not accepted any longer. A written report of this experiment will be published, when all guidances have been finished. 2.11.2018. Kim has now more free time than in several years. For this reason, he has taken the paywall off of emailing with him. Read info at Online Services page, 31.10.2018. Open Heart teachers offer 15 Guidances to Awakening for Free. Apply now 25.10.2018. Dates for 2019 have been published, 24.10.2018. Read About Awakening, a dialoque between Jetsunma Tenzin Palmo and Kim Katami, 21.10.2018. 132nd person awakened today in Guidance to Awakening, 20.10.2018. Guidance to Awakening-page has been updated, 6.10.2018. Account by Open Heart practitioner, "Overcoming Sexual Trauma Through Awakening". 5.10.2018. Reader feedback: "I decided to print it out, and while I was waiting impatiently by the printer, I was watching the pictures of Bhumi openings as they emerged. I never really saw the point of these before, but I suddenly realised that you can see the natural state in their eyes! Now I see!" Download What's Next? On Post-Awakening Practice, free of charge. 3.10.2018. Join Open Heart Yoga Online Empowerment through Zoom Video Chat on Sat 20th October. This highly effective practice that combines energywork and natural meditation can be learned through online empowerment and video lessons. Welcome all! 26.9.2018. 130th person (out of 132) awakened through Guidance to Awakening today. The awakening process is supported by a specific technique called The Two-Part Formula, that strikes at the bull's eye of the selfing mechanism, causing awakening or insight into selfless nature of mind. Find the technique and guided practices on video from our website, free of charfree of charge. 21.9.2018. What's Next?-book is now available in epub and mobi. Download here. 19.9.2018. Kim Katami's New Book Is Finally Here! Read and download for free! Interview with Kim Katami at Open Heart Sangha YouTube channel. 12.9.2018. Kim's Skype sessions are available again. See info at Online Services. 11.9.2018. Kim's new book "What's Next? On Post-Awakening Practice" will be published on Friday 14th of September on this website for free. On the following Saturday 15th of September there will be a Book Launch via live webcast at Facebook. Join in! 7.9.2018. 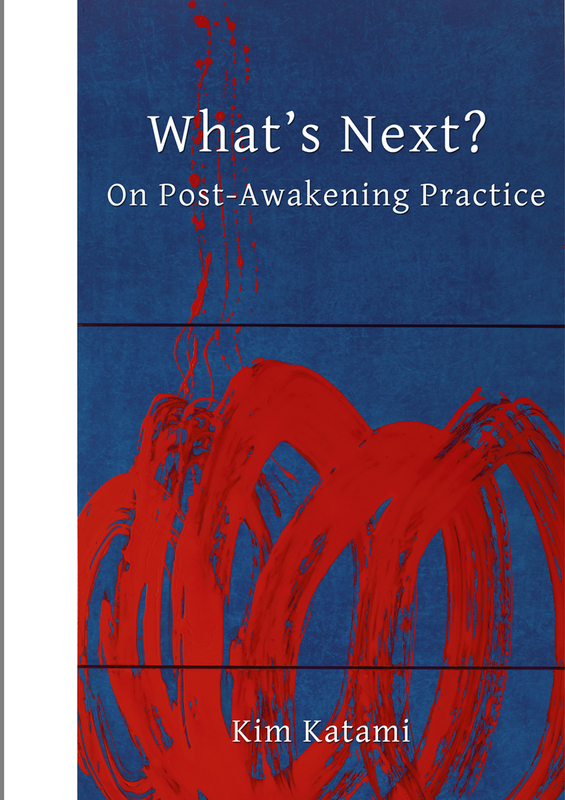 Kim will soon release his second book on the topic of post-awakening practice. It will be available for free. Stay tuned! 4.9.2018. Read about "Sean's Awakening", 31.8.2018. 129 people so far have awakened using the Two-Part Formula. 26.8.2018. Calendar updated with Online Retreat in September. 13.8.2018. Read Jonathan Shares His Awakening Experience from Positive Life, 11.8.2018. The Two-Part Formula and Guidance to Awakening has helped 126 people in getting awakened. When is your turn? 28.7.2018. Hi folks! There are still a few open spots on the upcoming Summer Retreat in UK 18.-25.8.2018. This retreat will be a bit different from other retreats as we focus on love, compassion, do a lot of chanting and as usual sit nonmeditation. Its an amazing venue and its going to be a great retreat. You can find details of it in the link below. Everyone is welcome! The fees of learning Open Heart Yoga online have been lowered. The next empowerment of Open Heart Yoga Level 1 will be given on Saturday 1st of September. Welcome! 17.7.2018. Read about people's experiences with Open Heart practice, "Feedback and Comments". 4.7.2018. The upcoming online empowerment to Tibetan Heart Yoga on 7th of July will be free of charge. Go to calendar and register now, limited number of seats. 30.6.2018. Read "An Open Letter to Buddhist Forums by the Open Heart Sangha and Teachers" from the announcements, 21.6.2018. Some video teachings at YouTube from the recent events in UK. 2. Intention, Attention and Awareness. 3. What is Emptiness? How to Make Sense of Emptiness? 4. Receiving a Teaching (Terma) from Sakya Sri by Karl Eikrem and Kim Katami. Learn Tibetan Heart Yoga Online. Next empowerment will be given on Saturday 7th of July. Check details from the calendar and register now. 14.6.2018. Erik Pema Kunsang, a well known buddhist teacher, author and translator has given his endorsement to the Two-Part Formula that is used in Guidance to Awakening. 13.6.2018. Birmingham City Retreat in September has been rescheduled for December. See calendar. 12.6.2018. Thank you to all those who joined the city retreat in Birmingham, UK, in person or through webcast. Next webcast teachings will be streamed from Dublin, Ireland, in July. Find time details from the calendar. You are welcome to join in person too! 11.6.2018. This weekend there will be some Facebook live streams, guided tantric and nonmeditation practices, from Birmingham (UK time zone), either in Open Heart Sangha or Open Heart.fi-group. Saturday 9-11.30 am & 12.30-3 pm. Sunday 9-11.30 am & 12.30-3 pm. Welcome! 1.6.2018. Our head teacher Kim Katami will give an empowerment to The Song of the Vajra on Saturday 9th of June (time changed) at Facebook. All are welcome to join the session, free of charge. Find the event here. 30.5.2018. The teaching staff and the head teacher of Open Heart have released our Safeguarding Policy. 20.5.2018. Tibetan Heart Yoga of Guru Rinpoche is a master practice of tantric vipashyana and nonmeditation (dzogchen atiyoga). What makes the practice special and especially effective is how the powerful blessings of the buddhas is injected into the mind with the outcome of immense purification within a very short time of practice. Applying the different techniques of Tibetan Heart Yoga also reveals the natural state, the empty awareness of all buddhas, which is the pinnacle of all buddhist paths. Tibetan Heart Yoga is meant for common laypeople with jobs and families. Join Tibetan Heart Yoga Level 1 teachings on the first weekend of June in Birmingham, UK. 20.5.2018. Read "Hush! It's Secret!" from Open Heart-blog. 16.5.2018. Last week we had two retreat intensives in Dublin, Ireland. The City Retreat was joined by 22 people from UK, Ireland, Norway and Finland. Three people received confirmations of their awakening and the retreat itself helped five people to open their next bhumis. Thank you to all who joined! Find upcoming courses and retreats from the calendar. 15.5.2018. See what people say about Open Heart at "Feedback and Comments". 15.5.2018. Teachings-menu and the Intro-page has been thoroughly updated. 11.4.2018. All our residential and non-residential/city retreats can now be joined by all interested! Guided Tibetan Heart Yoga-sessions are restricted to those who have learned Tibetan Heart Yoga level 1. Welcome! 10.4.2018. 120 people so far have woken up through The Two-Part Formula. These people range from long time meditators to complete new comers. Find the instructions and loads of free materials from this website. 8.4.2018. Learn Tibetan Heart Yoga in Dublin Ireland 20th-22nd of April. Find details from the calendar, 15.3.2018. Next online empowerment of Tibetan Heart Yoga through Skype will be on Saturday 14th of April at 10-11 am Finnish time. Register now. 14.3.2018. This Sunday an empowerment of Tibetan Heart Yoga is given online through Skype video call. Few seats are still open. 2.3.2018. Welcome to a City Retreat (non-residential) at Helsinki in April. Find details from the calendar. 28.2.2018. Next online empowerment and course of Tibetan Heart Yoga will be held on Sunday 4th of March. See calendar and book your seat now. 20.2.2018. Finally! Awake! -ebook has been updated. Get it for free here. 10.2.2018. 129 people until today have awakened through the Two-Part Formula freely taught by Open Heart. 9.2.2018. All 3 levels of Tibetan Heart Yoga can be learned through online courses. Read info here. 7.2.2018. Read the new instructions about Bhumi Analysis available through Online Services. 7.2.2018. Read "Public Announcement 2/2018" about joining of the DharmaMind Sangha and Open Heart Sangha. 3.2.2018. Dates reg. the upcoming City Retreats in Dublin and Birmingham were updated in the calendar. These retreats start on Friday evening and continue through Saturday and Sunday. If you already made plans of joining from Saturday morning, it is not a problem. 26.1.2018. Read "Pointers to Awakening" from the OH-blog, 20.1.2018. Read "Quotes about Awakening and Practice from Zen-teachers with Kim's Comments", at OH-blog, 18.1.2018. See a new episode of the Bhumi Study Series, "From Zero to Mahasiddha Bhumis". 16.1.2018. Video recordings of the recent Winter Retreat are now available at YouTube. 15.1.2018. Next Online Empowerment of Tibetan Heart Yoga with self-study materials, will be held on Saturday 20th of January. Book your place now. 10.1.2018. Read "Controversy about Open Heart", 8.1.2018. 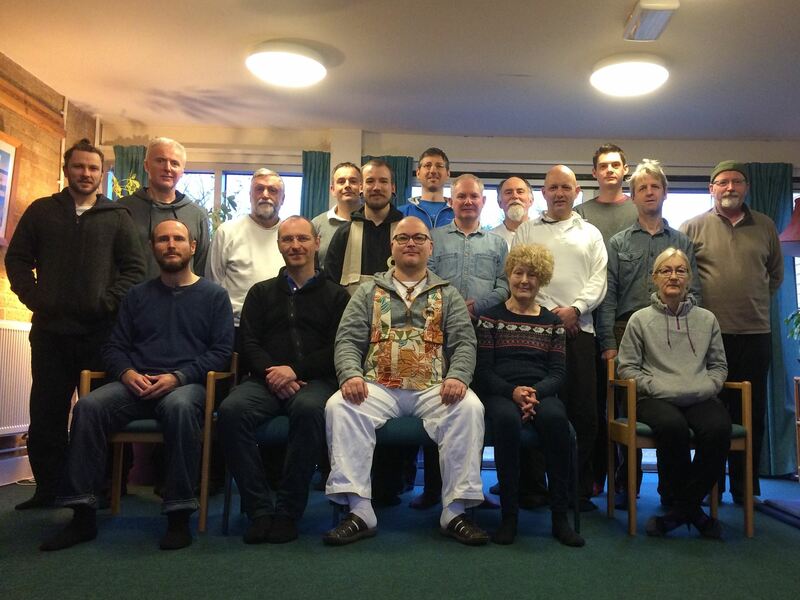 Greetings from the British-Irish-Scottish sangha from the recently finished Winter Retreat. 4.1.2018. The whole Bhumi Study Series has been updated. See directly from people's faces how Open Heart-teachings do. 21.12.2017. Our head teacher, Kim, is accepting teaching requests for 2018. Contact him directly by email, kimkatami@hotmail.com, to discuss, 20.12.2017. Tibetan Heart Yoga Level 1 Online Empowerment and Online Course on Sat 20th of January 2018. Register now. 19.12.2017. Schedule was updated with 4 residential retreats in UK in 2018. Welcome! 14.12.2017. Kim is taking a Winter break (11.12.-26.12.) before the Winter Retreat in England (27.12.-3.1.2018). During this period he is not answering emails or calls. Merry Christmas and Happy New Year! 11.12.2017. Read "Why I Didn't Quit Guru Yoga", 7.12.2017. Read and see photos of Shane's Awakening, 5.12.2017. Dates for Bodhi-training in Dublin, Ireland in 2018 have been added to the Schedule. Welcome! 29.11.2017. News from UK and Ireland. The upcoming Winter Retreat in UK is fully booked with a waiting list. We never had a waiting list on Open Heart retreat before! Also, from next February there will be 4 weekends of Bodhi-training in Dublin, Ireland. Stay tuned for dates. 28.11.2017. On Saturday 9th of December at 4 pm Finnish time there will be a Refuge Ceremony webcasted live from Helsinki at Open Heart Sangha group at Facebook. Welcome all sangha members! 26.11.2017.